Guys, I need ice cream. And not just any kind of ice cream. Oh no, I need super special, super summery fruity-to-the-max ice cream. 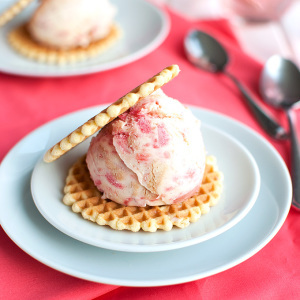 In other words, I need another scoop of this amazing vanilla ice cream with rhubarb compote and a cookie swirl. Yes! Wait, what? How was the Taylor Swift concert, you say? Well… awesome! Thanks for asking. My niece and I had the best time ever: the show was rocking (even though Tay is the queen of pop these days), every second person we met complimented us with our bright pink tutu’s (they even admired my, um, “incredible sewing skills”), and the look on my niece’s face when Taylor appeared on stage was priceless! But enough about the concert, let’s talk ice cream! To be honest, the weather around here hasn’t been summery at all! I don’t know about you, but torrential rain and near-freezing temperatures (oh all right, “moderate” temperatures) aren’t exactly my idea of summer. Which is why I’m in need of ice cream right now! Ice cream always makes me think of summer, whether I’m chilling out on a sunny beach wearing nothing but a pink bikini and half a bottle of sunscreen, or snuggling up under a blanket next to a cozy fire: to me, ice cream takes me back to those days when me and my peeps (aka: my family) would go out on warm summer evenings for ice cream and a stroll in the park. 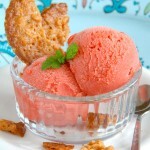 And this particular ice cream is super summery. I think I mentioned that, didn’t I? Well, it’s true. 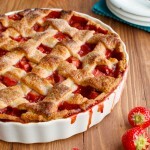 Because, like ice cream, rhubarb to me equals summer! So this ice cream is summer to the max. But with cookies! And no, I didn’t bother making homemade cookies, so there’s no baking involved in this recipe. You just cook up the vanilla ice cream base, make a nice little rhubarb compote and open a roll of your favorite buttery, crumbly cookies. 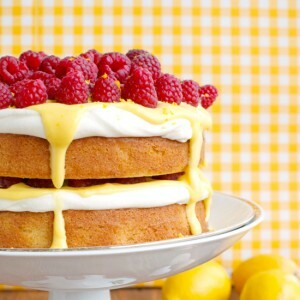 Try lemon shortbread, for example. Or just plain vanilla shortbread. Or experiment with crunchy oatmeal cookies! 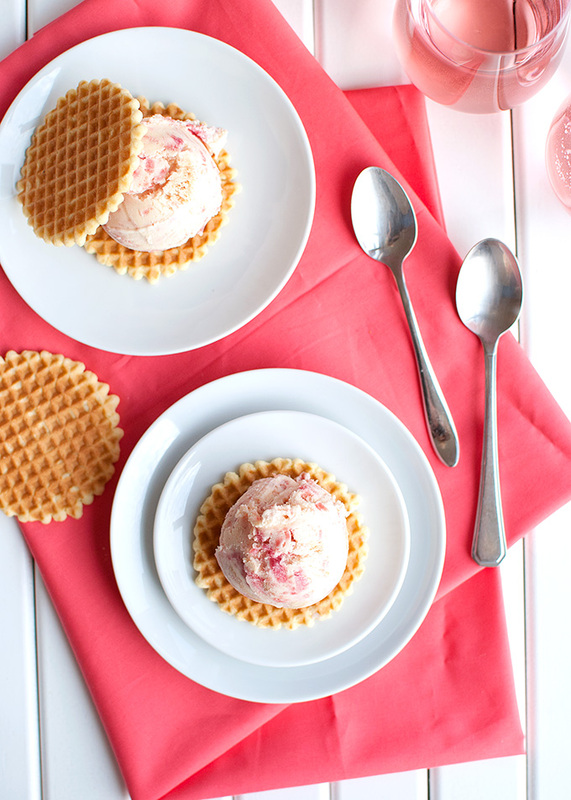 Just make sure the cookies are crumbly and buttery, because the buttery tones pair really well with the tangy rhubarb and the vanilla ice cream. Almost like a rhubarb crumble or crisp! 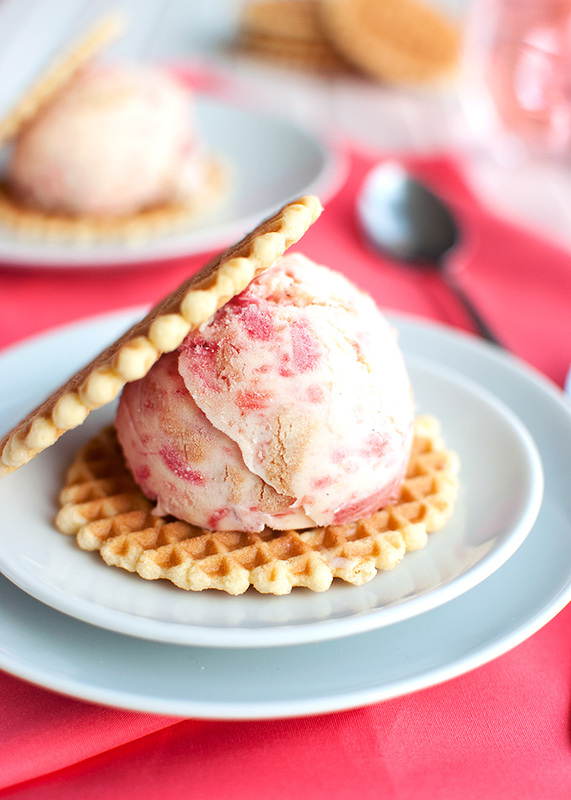 Oh, and if you want to make the ice cream look all sophisticated like I did, don’t forget to get some butter waffle cookies for serving, too! If you want to, you could even serve this ice cream as a real ice cream sandwich. That’s it, guys. Enjoy the recipe! And don’t forget that you really don’t need an ice cream maker to make ice cream at home. If you have a freezer and are willing to stir the ice cream every half an hour until it’s frozen (and who wouldn’t if the end result is as delicious as this?) you’re good to go! Makes about 1 liter (or about 1 quart) of ice cream. In a large saucepan, combine the milk, two thirds of the cream, 150g (or ¾ cup) of sugar and salt. Pour the remaining cream in a medium-sized heatproof bowl and set a fine-meshed strainer over the top. Stir in the vanilla. Add the yolks and the remaining sugar (25g or 2 tablespoons) to another medium-sized bowl and whisk in a splash of the milk and cream mixture (about 3 tablespoons). Whisk until foamy, about 2 minutes, then set aside. Place the saucepan with the milk and cream mixture over medium-high heat and heat gently, whisking to dissolve the sugar. Once the sugar has dissolved, bring the mixture to scalding point. Remove from heat. While whisking continuously, slowly pour the hot milk mixture into the yolk mixture. Once all the liquid has been added, pour the egg-milk-cream mixture back into the saucepan. Gently heat the mixture over low heat, whisking continuously, until the bubbles and foam disappears, the mixture has thickened, and can coat the back of a spoon. NOTE: To test whether the mixture - or crème anglaise - is done, dip a spoon in the mixture and run your finger through the custard down the back of the spoon. If the path you've just created with your finger holds its shape and there is no more foam on top of the custard, the custard is done. If you are unsure about this step, you can use a sugar thermometer. The crème anglaise is done once the mixture reaches a temperature of 80°C (175°F). 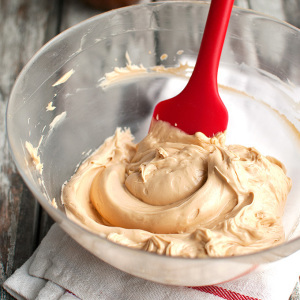 Take the crème anglaise off the heat and pour it through the strainer into the prepared bowl with cream. Stir to combine. Leave the custard to cool to room temperature, then cover with plastic wrap and chill the mixture in the fridge for at least an hour or overnight. Combine rhubarb and sugar in a large pan (off heat). Let it stand for about 10 minutes to allow the rhubarb to start releasing its juices. Place the pan over medium-high heat and bring the mixture to a boil, stirring occasionally with a wooden spoon. Once the mixture has come to a boil, crank the heat down to low and allow the rhubarb to simmer, stirring regularly, until it breaks down, about 5 minutes. 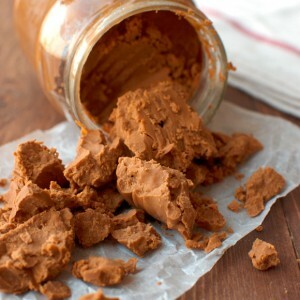 Remove from heat and transfer to a heatproof container (such as a mason jar) and allow to cool to room temperature. Cover and place in the fridge until needed*. Churn the chilled ice cream base in your ice cream maker according to the manufacturer's instructions, or freeze the mixture 'manually' by placing it in a freeze-proof container in the freezer and stirring vigorously every half hour until it has frozen (this may take up to 3 hours, depending on the temperature of your freezer). In the meantime, using your hands, break the cookies into 1-cm/ ½-inch pieces. 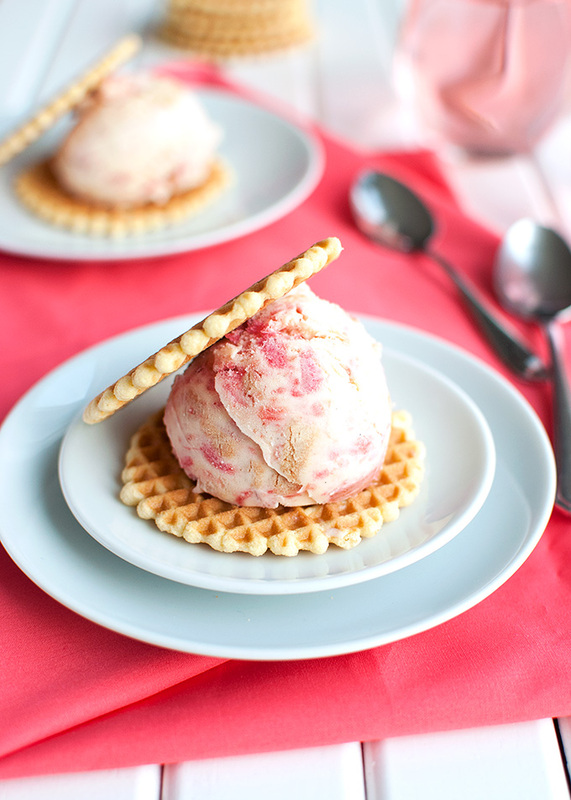 Once churned, transfer the ice cream to a large bowl and fold in the rhubarb compote and the cookie pieces. 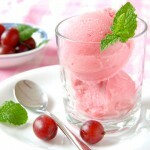 Transfer the ice cream to a freeze-proof container and freeze for at least 6 hours. Twenty minutes before serving, take the ice cream out of the freezer and allow to soften in the fridge or on the counter. Enjoy! 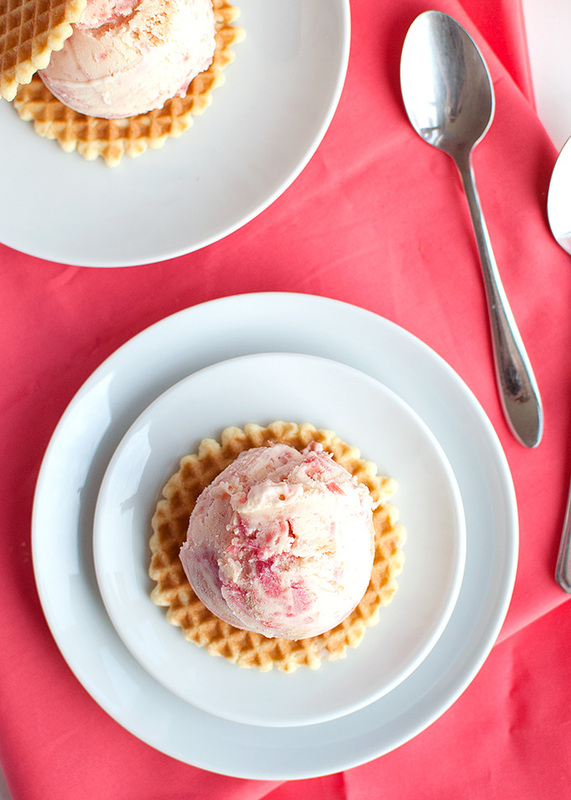 I always make both the ice cream base and the rhubarb filling the day before I actually want to churn the ice cream. That way, both elements have time to chill in the fridge overnight. That looks good we haven’t been having very summery weather ether It’s only been 100 F ish lately!